From Alexander the Great to Abraham Lincoln, wrestling has been preparing leaders for thousands of years. What enables a successful wrestler to become a leader is the mental toughness, heart, and confidence that the sport instills. Successful wrestlers develop these traits through unparalleled preparation, perseverance, and discipline. Together these virtues enable wrestlers to work with allies to create the opportunity to execute a shared vision, as evidenced by the experiences of wrestlers who became leaders in fields like politics, writing, and medicine. Before he was a president, Abraham Lincoln was a wrestler. In 1831, in the most important match of his career, the twenty-two-year-old Lincoln wrestled Jack Armstrong for the right to be called the toughest man in New Salem, Illinois. New Salem was a tiny pioneer settlement, where life was demanding and only the most determined could survive. Lincoln had come to New Salem to work as a clerk in a general store for a man named Denton Offutt. Offutt’s rival, William Clary, owned the other general store in New Salem. Clary’s store was known to attract tough men, and twenty-seven-year-old Jack Armstrong was known as the toughest of them all. Soon after Lincoln arrived, Offutt began to brag to Clary that the six-foot, four-inch and 185 pound Lincoln — huge for the time — was the strongest man he knew. Wrestling was the best way to determine the strength and will of a man, and matches were a regular occurrence in New Salem. Long and lean, Lincoln had the perfect build for wrestling and had developed strength and endurance from years spent swinging an axe. Talk of a match between Lincoln and Armstrong quickly reached the point where neither man could back out without being labeled a coward. Tired of Offutt’s boasting, Armstrong accepted the challenge to wrestle Lincoln. As it did for Lincoln, wrestling has been challenging men for thousands of years. Regularly cited as the world’s oldest sport, wrestling was practiced by ancient Greeks, Nubians, and Indians. Records show that the ancient Egyptians were practicing wrestling over five thousand years ago.Wrestling is mentioned in The Epic of Gilgamesh, the Bible, and The Iliad, three of the oldest pieces of literature known to man. A wrestling match pits two people against each other in a battle for control, where determination, grit, and pride are the keys to success. The dominant wrestler imposes his will on his opponent and tries to break his spirit. While strength matters, technique, leverage, and heart are the deciding factors in many matches. Wrestling came to the Americas in the early 1600s with the first colonists. During this period, wrestling was a pastime, a sport, and a way to stay in shape. 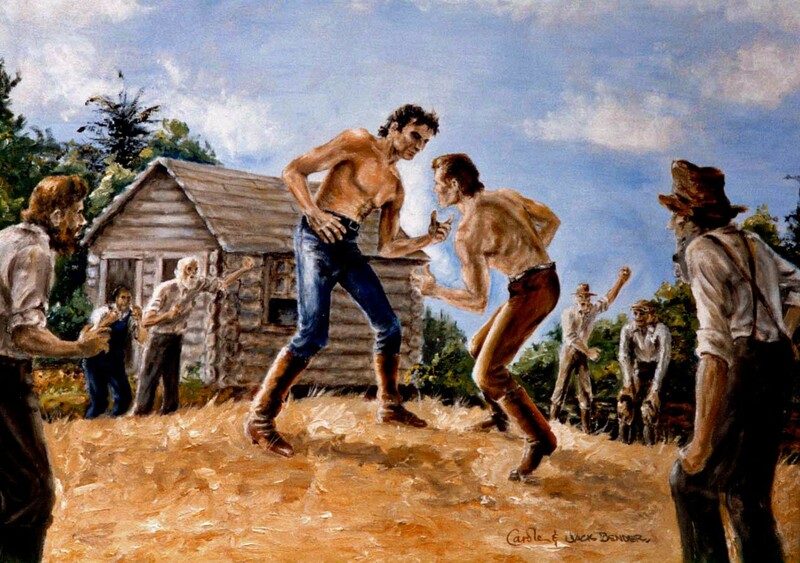 Award-winning wrestling historian Mike Chapman makes a distinction between the organized and rule-based wrestling of today and the rough-and-tumble forms practiced by early Americans, which he refers to as tussling. Tussling was common in the military, and presidents Jackson, Tyler, and Taylor likely participated during their time in the army. President Grant was also a tussler, and liked to wrestle with his boys on his hardwood floor. After Grant’s presidency, in 1888 the Amateur Athletic Union formed and began to organize competitions. These competitions had a carnival atmosphere, comparable to the mixed martial arts fights of today, and were hugely popular throughout the late 1800s and early 1900s. In the early 1900s, wrestling was among the most popular sports in America, and President Theodore Roosevelt was a huge fan. Roosevelt strongly valued fitness and in his autobiography wrote “wrestling enabled me to get a good deal of exercise in condensed and attractive form.” In fact, as governor of New York Roosevelt invited the champion middleweight wrestler of America to work out with him three or four afternoons a week. President Taft, who succeeded Roosevelt, may have done wrestling as an intramural sport at Yale. President Coolidge may have briefly wrestled in gym class at Princeton, and President Eisenhower learned wrestling at West Point from the legendary Tom Jenkins, former American Heavyweight Champion. Since Eisenhower, wrestling has continued to evolve, and today over 180 countries participate in the sport. In the last decade alone, high school participation has increased by 40,000, and today wrestling ranks as the sixth most popular boys sport with over 270,000 participants nationwide and 10,488 teams. In addition, the number of women who wrestle in high school has increased ten-fold since 1994 to over 8,000. Most recently, wrestling helped the United States, Iran, and Russia find common ground when the countries united to help save Olympic wrestling and secure a bright future for the sport. With new levels of participation come new opportunities to use wrestling to develop character and prepare young men and women for life and leadership. Warren Bennis — one of the world’s leading experts on leadership and a man who has advised four U.S. presidents — says that leadership is the factor that ultimately determines which organizations succeed and fail. Being a successful leader requires developing and executing a shared vision, seizing opportunities, and creating allies. Wrestling can prepare someone to become a successful leader in any domain by providing a series of experiences that instill confidence, heart, and mental toughness. As today’s wrestlers prepare to become tomorrow’s leaders, they can learn from these leaders, whose experiences reveal how wrestlers develop these traits, and why they enable someone to be a leader on and off the mat. Successful wrestlers develop the virtues to become leaders through discipline and preparation. No wrestler better exhibits this than Dan Gable, whose legendary work ethic translated into a confidence that he could outwork and fatigue every opponent. Gable’s commitment to out-preparing his opponents won him 181 straight matches through high school and college, a seven-year streak that was snapped when Gable lost in the last match of his college career in the NCAA finals. A true champion, Gable was able to come back stronger from his loss and won Olympic gold in 1972 without giving up a single point, a feat comparable to winning Wimbledon on serves alone. Gable’s preparation allowed him to wrestle at such a high intensity that he once made a great Soviet wrestler quit in the middle of the match because Gable had broken his spirit. Wrestling, in particular, is thought to require more individual commitment than most other sports due to the nature of the training and competing itself…With other sports, an athlete can go to practice or a game, and then go home to relax. Wrestlers, due to the weight class requirements, have to maintain their focus and drive around the clock for years at a time. In addition, wrestling is an individual sport and the athlete experiences both failure and success as an individual. As a result, the wrestler endures more physical, emotional, and psychological stress, both positive and negative, than an athlete in another sport. Irving learned discipline through countless hours spent drilling wrestling moves. He compared the repetition and drilling he first did as a wrestler to the revising and rewriting he does as a writer. “Doing anything well,” he said, “requires…doing the same small things again and again.” That repetition is what helped 1984 Olympic Gold Medalist Ed Banach to become a champion. After a tough loss during his senior year at Iowa wrestling for Coach Gable, Banach was determined to do whatever it took to become an NCAA champion, and at the suggestion of Coach Gable added a third workout at five am to his training regime to drill a single takedown seventy-fives times every morning. By the time nationals came around, he had practiced the move over 3,000 times. In the national finals, wrestling against the same opponent who had beaten him earlier, he used that takedown to avenge his earlier loss and win his third NCAA title. Wrestling also teaches the importance of perseverance. In a wrestling match, you can be losing even in the final seconds and still have a chance to win; you are never completely out until the match ends, so you learn never to quit. Governor Chafee has a story that he calls “the highlight of my coaching career.” He had a wrestler losing 8–4 with thirty seconds left, when he told him that he needed to escape, take his opponent down, and put him on his back. When the whistle blew, “he powered out like a stick of dynamite and took him down like a lion to win.” Congressman Leach also credits wrestling with developing perseverance, which only becomes a part of you when “you participate, and continue to participate. That gets ingrained in the wrestling room.” Jim Nussle — a congressman from Iowa who joined the wrestling team in high school for conditioning — echoes Leach’s sentiment, saying there is “nothing like doing it over and over.”Nussle says that the work ethic he developed in wrestling is similar to the work ethic for politics, with conditioning, practicing, and always competing being especially important. Politicians also need to show humility, especially when it comes to elections, where “winning 55% of the vote means that 45% of the people didn’t want you.” No politician better understood this than Abraham Lincoln, who lost eight elections before he became president. Wrestling helps with the “recognition that you don’t win everything, and even when you win, there are a lot of humbling experiences.” Every wrestler develops a sense of humility that accompanies the failure he experiences on the mat, enabling them to connect with others and build the trust that is essential for leadership. Characterized by their preparation, discipline, perseverance, and humility, successful wrestlers develop the mental toughness and heart that translates to achievement on and off the mat and becomes as much a part of them as their cauliflower ear. This enables wrestlers to carry these traits off the mat and use them to accomplish whatever they set out to do. As John Irving said, “wrestling is a discipline; long after you stop wrestling, you carry the discipline with you.” With that discipline comes the ability to lead others, and it begins by constructing a vision around which a group of people can rally. Developing and communicating a vision is perhaps the most important part of being a leader. In his study of over ninety of the most effective leaders across the nation in both the public and private sector, Warren Bennis said that vision was one of the traits most apparent in these leaders, “their ability to draw others to them, because they have a vision, dream, set of intentions, an agenda.” Vision is equally important on the wrestling mat; no one ever becomes a champion without first dreaming about it. What makes a leader’s vision special, Bennis notes in his study, is that “leaders know themselves; they know their strengths and nurture them.”Wrestling also gives people the opportunity to learn about their strengths and weaknesses, and in the process learn how to translate a vision into reality. Vision is arguably the most important job of a coach. Only a coach who gets his wrestlers to believe his vision of how to be successful will have a team that push each other to bring out their best. Dan Gable’s success as a coach resulted from his ability to “transfer his intensity to others,” helping his athletes develop the mentality of a champion. When Gable’s wrestlers were exhausted and ready to break, he would have them visualize going out in front of 14,000 fans to compete and ask them what they were willing to do to make sure they did not lose. These visualizations helped his wrestlers learn to function when they were exhausted and develop the mental toughness that gave them the edge. This resulted in the confidence to outwork any opponent, knowing that their ruthless workouts gave them the stamina to outlast anyone. Getting a team to buy into “the shared vision of individuals and the idea that everyone is giving maximum effort” results in a special camaraderie that Governor Chafee discovered when he was coaching. Coaching also helped teach Chafee the importance of incentives in a vision. Despite spending weeks working with his team on a new move, no one used it in a match until Chafee offered a silver dollar to the first person to use it. He found this incentive got his team fired up, because all of a sudden there was a challenge of who could be first. Through the help of their coaches, successful wrestlers learn about themselves, set goals, and develop a vision of how to accomplish them. Their vision allows them to see the connection between the work they put in and their success. This helps wrestlers become leaders by enabling them to work to create opportunities that other people do not see or think are too difficult. One of the most difficult challenges wrestlers face is making weight, the process of carefully dieting for weeks or months at a time in order to reduce their weight to the lowest possible weight class. Making weight is one of the most grueling aspects of the sport, but a wrestler who does not make weight does not get the opportunity to compete. He cannot simply move up a weight class after not making weight because that would be taking the spot of a teammate with the discipline he lacked. Through making weight, wrestlers learn that it takes work just to create opportunity. All leaders must learn this lesson, and it is especially true in politics, where you first have to gather signatures in order to be able to get on a ballot, and then have to win an election before actually having the opportunity to govern. Certain achievements are only tickets to the arena. Training and making weight only allow a person to step on the mat. Going to college permits one to look for certain jobs; getting an MD and a medical license allows the practice of medicine; having a lab and a university position lets one compete for funding; being invited to speak provides a podium. The real effort follows: The wrestling; the working; the care of patients; the discovery of science; the convergence of knowledge with message. Bruce Kinseth was known for his ability to make weight by losing ten pounds in a one-hour workout, a feat made possibly by his “incredible physical shape…but really…his mental toughness.” That toughness propelled Kinseth to pin every opponent he faced in the 1979 NCAA tournament and win both a national championship and the outstanding wrestler award. Of course, Kinseth would never have achieved greatness if he were not first able to successfully make weight. Wrestlers understand this instinctually: they cannot compete without first making weight; they cannot win a state or national championship without first grinding through an entire season. All leaders also learn this same lesson: you do not get to lead without first doing the unglamorous work to create the opportunity. Behind every successful leader is an outstanding team, and behind every successful wrestler are outstanding teammates and coaches. Though wrestling is an individual sport, it takes a team to succeed. Without teammates to work out with, a wrestler would be unable to train, and without a coach to believe in him, a wrestler would never reach his potential. A leader also needs allies to succeed, and finding people who support their vision is one of the biggest challenges a leader faces. Wrestling teams are built on this shared accountability, and teammates and coaches become some of the strongest allies a wrestler develops. During a year as a high school assistant wrestling coach, Governor Chafee made lifelong friends. Congressman Nussle also stuck with wrestling “in part because he liked the guys on the team.” Nussle acted as an ally to his state-champion teammate, serving as his workout partner and someone who would consistently push him to get better. I feel more a part of the wrestling community than I feel I belong to the community of arts and letters. Why? Because wrestling requires even more dedication than writing because wrestling represents the most difficult and rewarding objective that I have ever dedicated myself to; because wrestling and wrestling coaches are among the most disciplined and self-sacrificing people I have ever known. No story illustrates the way wrestling can turn competitors into allies than the story of Lincoln and Armstrong. After Lincoln defeated Armstrong and earned the respect of the community, he and Armstrong became lifelong friends, and Lincoln would often visit Armstrong’s cabin and help with farm work. Their bond would continue after Armstrong’s death, and when Lincoln discovered that Armstrong’s son was accused of murder, he told Armstrong’s wife that he would defend him, writing “gratitude for your long-continued kindness to me in adverse circumstances prompts me to offer my humble services gratuitously in his behalf.” During the trial, Lincoln proved that Armstrong’s son was innocent by showing that a key witness was lying about his testimony. As president, Lincoln famously put his former political rivals in his cabinet, again converting former competitors into allies. 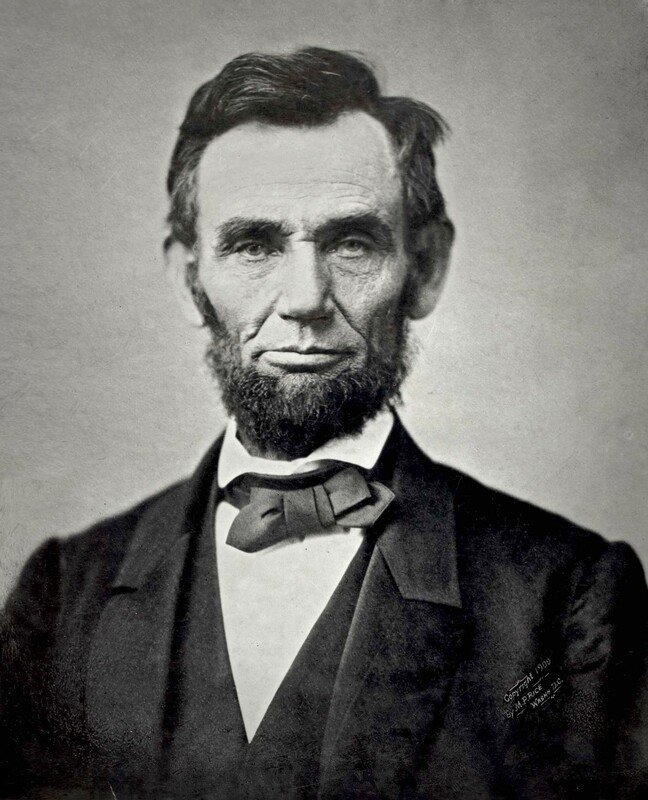 Although it clearly had a large impact on his life, wrestling does not define President Lincoln and cannot take sole credit for his exceptional leadership. No single experience, even one as enduring as wrestling, makes a leader. As Congressman Nussle puts it, “I am the sum total of all my experiences, of which wrestling is a small part.” However, the mental toughness, heart, and confidence that wrestlers develop are the same traits it takes to be a successful leader, which explains why so many wrestlers become leaders at whatever they choose to pursue. Wrestling has made me into the person I am today, which is the reason I choose this topic for my paper. I would like to use this opportunity to thank everyone who has supported my wrestling career, especially John Staulo, my high school coach and the man who introduced me to the sport. I would also like to thank all my other high school and college coaches as well as my friends and family. Lastly, I would like to thank everyone who helped make this paper possible, including Professor Richard Larson, Michael Strazzella, and everyone who took the time to let me interview them. Wrestling and writing this paper have been a privilege and a joy, and I am grateful and indebted to everyone who made this possible. Academy of Achievement. “Keys to Success: Preparation.” Accessed January 1, 2014. http://www.achievement.org/autodoc/steps/prp?target=irv0-010. Bennis, Warren G.. An Invented Life: Reflections on Leadership and Change. Reading, Mass. : Addison-Wesley Pub. Co., 1994. Chafee, Lincoln. Interview with author. Phone call. Cambridge, MA. December 13, 2013. Chapman, Mike. Interview with author. Phone call. Cambridge, MA, November 14, 2013. — . The sport of Lincoln. Newton, IA: Culture House Books, 2003. — . Super Book of Wrestling Trivia and History. Newton, IA: Culture House Books, 2013. — . Wrestling Tough. Champaign, IL: Human Kinetics, 2005.
Cooper, Steve. “Why Wrestlers Make the Best Employees.” Forbes, July 31, 2012. Accessed October 30, 2013.www.forbes.com/sites/stevecooper/2012/07/31/why-wrestlers-make-the-best-employees/print/. Gahl, William. “Grappling with Life.” Wrestling Stories, Accessed December 1, 2013 http://wrestlingstories.org/project/william-gahl. Irving, John. Interview by author. Email. November 26, 2013. Jensen, Keld. “Rock Bottom: How Great Leaders Triumph Over Failure.” Forbes, August 8, 2012. Accessed April 10, 2014.http://www.forbes.com/sites/keldjensen/2012/08/08/rock-bottom-how-great-leaders-triumph-over-failure/print/. Klingman, Kyle. “Author John Irving still wrestling with his writing.” WIN Magazine: Amateur Wrestling News, December 8, 2010. Accessed November 18, 2013. http://www.win-magazine.com/2010/12/author-john-irving-still-wrestling-with-his-writing/. — . Interview by author. Phone call. Cambridge, MA, November 12, 2013. — . Interview with John Irving. Wrestling Insider Newsmagazine, February 1, 2013. Krumrie, Matt. “Don’t Fear Failure: The Value of Letting Kids Test their Limits.” USA Wrestling, October 15, 2013. Accessed November 18, 2013.http://www.themat.com/section.php?section_id=3&page=showarticle&ArticleID=27090. Leach, James. Interview with author. Phone call. Cambridge, MA, December 11, 2013. National Wrestling Coaches Association, “Wrestling Facts.” Accessed January 2, 2014.http://www.nwcaonline.com/nwcawebsite/savingwrestlinghome/facts.aspx. Nussle, James. Interview with author. Phone call. Cambridge, MA, December 10, 2013. Roosevelt, Theodore, Theodore Roosevelt An Autobiography. New York: The Macmillian Company, 1914. Stephenson, Nathaniel W, editor. An Autobiography of Abraham Lincoln. Indianapolis: The Bobbs-Merrill Company Publishers, 1926. USC Marshall School of Business. “Faculty Profile Warren Bennis.”Accessed October 30, 2013.http://www.marshall.usc.edu/faculty/directory/warrenbennis. Chapman, Mike. The Sport of Lincoln. Newton, IA: Culture House Books, 2003. 2. Chapman, Mike. The Sport of Lincoln 2. Although the number of women participating in wrestling has grown over the past several years, because most participants are still men, I choose to use masculine pronouns. Chapman, Mike. The Sport of Lincoln. 8. Klingman, Kyle. Interview by author. Phone call. Cambridge, MA, November 12, 2013. Klingman, Kyle. Interview by author. Chapman, Mike. Interview with author. Chapman, Mike. Wrestling Tough. Champaign, IL: Human Kinetics, 2005. 22. Chapman, Mike. Wrestling Tough. 22. Klingman, Kyle. Interview with John Irving. Wrestling Insider Newsmagazine, February 1, 2013. Chapman, Mike. Wrestling Tough. 99. Chaffe, Lincoln. Interview with author. Phone call. Cambridge, MA. December 13, 2013. Leach, James. Interview with author. Irving, John. Interview with author. Chapman, Mike. Wrestling Tough. 50. Klingman, Kyle. Interview with John Irving. Chapman, Mike. Wrestling Tough. 155. Nussle, James. Interview with author. Chafee, Lincoln. Interview with author. Chapman, Mike. Wrestling Tough. 64. Chapman, Mike. Wrestling Tough. 110. Chapman, Mike. The Sport of Lincoln. Chapman, Mike. Wrestling Tough. 237. Chapman, Mike. The Sport of Lincoln. 32. Chapman, Mike. Super Book of Wrestling Trivia and History. Newton, IA: Culture House Books, 2013. 8. Chapman, Mike. The Sport of Lincoln. 30.